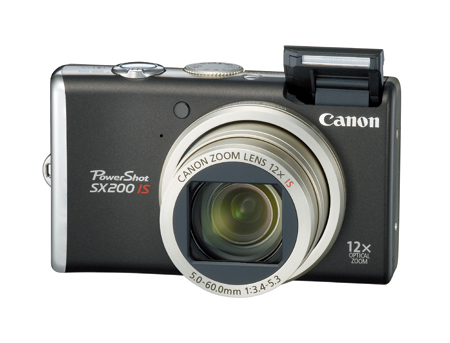 "PowerShot SX200 IS", with "equipped with 12x zoom & random features" as a catchphrase, is a compact digital camera that could become a new hit in Canon's "PowerShot" series. Even though it is literally a "multi-purpose, high-performance camera" equipped with 12x zoom, still camera, high vision movie camera and picture playback function, it still is slim, compact, and finished in an organized design. Especially the shape of the body with a gentle swelling on the right side that allows a steady handling without a protruding grip matches with the concept of not going with the trend and focusing on the practicality. Looking at the body design historically, it is said to be the reincarnation of the shutter-type film camera "Autoboy 3" with a 35mm lens which was introduced by Canon in 1986 and dominated the world. "By looking back, one can see the future"; it can be said that this is a highly evaluated product.